Posted on May 23, 2018 at 6:47 pm. 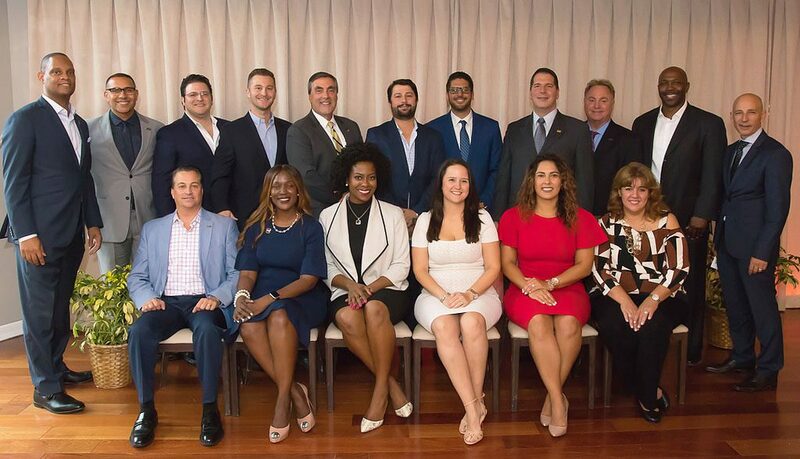 Alumni, family and friends gathered at Coral Gables Country Club on May 17 to mingle and network at the 2018 Annual Cocktail Reception. The 2018-2019 Alumni Association Board of Directors was sworn in at this year’s Annual Cocktail Reception. At the event, Duane Wiles, associate vice president and executive director for the Office of Alumni Relations & Annual Giving, encouraged attendees to show pride in their alma mater by supporting athletics, attending homecoming and making gifts in support of the university. “Now is the time for our alumni to talk up FIU, to rep FIU, to be the voice of FIU, to tell the FIU story and to be activists,” Wiles said. 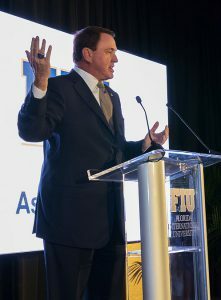 Attendees were treated to a special guest: FIU Football Head Coach Butch Davis. Under Davis’ leadership, FIU roared into the national spotlight in 2017, heading to St. Petersburg for the program’s first bowl game in six years and finishing the season with eight wins. FIU Football Head Coach Butch Davis hypes the crowd for a promising 2018 season. Davis introduced four members of the promising 2018 team and recognized several of FIU’s other successful athletic programs, including Beach Volleyball and Women’s Tennis. He stressed the importance of alumni supporting FIU student-athletes and their alma mater by attending games and buying season tickets. FIU alumnus Harry Pickering ’75 and his wife Barbara, an alumna of the University of Miami, are excited for the healthy rivalry anticipated in their household this fall. They’re FIU Football season ticket holders, as well as donors to FIU, and they’re looking forward to watching their two alma maters face off on Sept. 22. The event highlighted the First Generation Scholarship Program, to which donations are now matched by the state of Florida 2-to-1. The program supports students at FIU who are the first in their families to attain a bachelor’s degree. Nearly half of undergraduate students at FIU are first-generation. 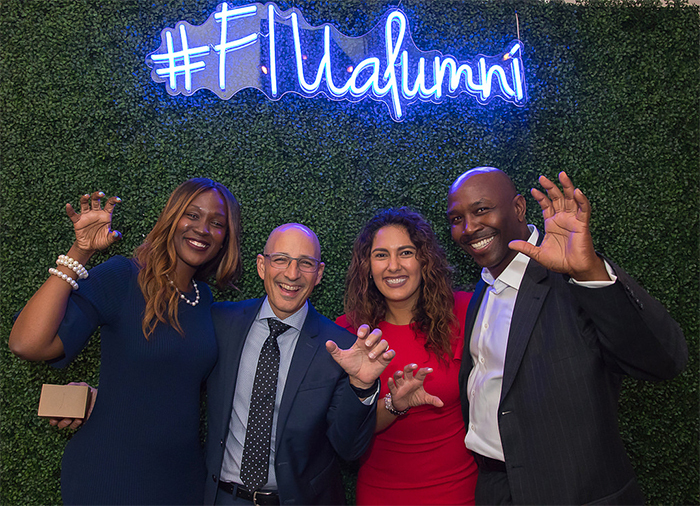 Together, attendees raised $3,100 for the program, which when matched by the state became $9,300 – enough to fund one first-generation student’s entire year at FIU. Harry Pickering, a retired police officer, said he feels it’s important to give back to FIU by supporting athletics and making gifts because FIU gave him so much. “Without FIU, I wouldn’t be who I am today,” he said.